It’s Maker Faire New York and for the Power Racing Series this means the final points race of the season! The Championship Race is our annual showdown of the very best teams from across the country. It’s pretty much Thunderdome without Mel Gibson. The highest-points-winning teams from the regular season get invited to attend and the points are reset to zero. Whomever gets the highest score this weekend wins our completely glorious and built-from-scrap Tesla Cup. 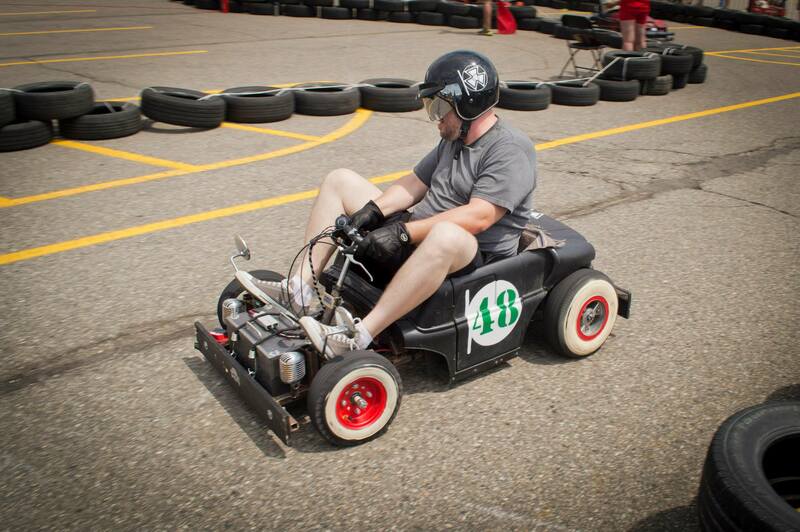 In 2010 we started the Power Racing Series (PPPRS); an all-electric, under $500, almost-motorsport that pits makers of all backgrounds against each other in a weekend long series of challenges that tests their homebuilt machine’s speed, handling, endurance and outright silliness. Points are rewarded on where you finish and how you finish; the crowd awards points on an arduino-controlled voting board based on teams live performances and general absurdity. This nation-wide league features over 40 teams from across the country, including several dozen hackerspaces that have quite a long history of participation. The reason PPPRS appeals to me as much as it does is how varied the level of technology in the entrants is. It reminds me very much of my other favorite sport of fighting robots – you have personal garage builds, schools, and basically professional shop spaces playing at the same level, and the professionals don’t always win. The rules are purposefully open-ended instead of heavily codified like most motorsports. Below I’m going to give you slightly detailed, yet utterly incomplete roundup of some of the teams contesting the title this weekend. I’d like to give a full list, but a few teams are being ultra secretive, or have simply fell asleep at their workshops trying to finish their car in under 12 hours. I’m sure they will eventually make their way to the track this weekend in some condition that will require coffee blacker than #00000. NIMBY has had led an incredibly simple yet ambitious campaign and if they keep their reliability streak going they just might bring the coveted Tesla Cup all the way back home to Oakland, California. Traveling in a tiny box with some help from Life Size Mousetrap, this team has officially become the first PPPRS entry to race both East and West coasts. Their bespoke chassis was built in 2013 from scrap, but looking at it, you’d hardly notice. This team has danced the closest to the budget rule, taking advantage of found parts more than any other, including a used lower end Altrax SPM series controller and creatively reusing components from all sorts of Oakland racing hijinks. 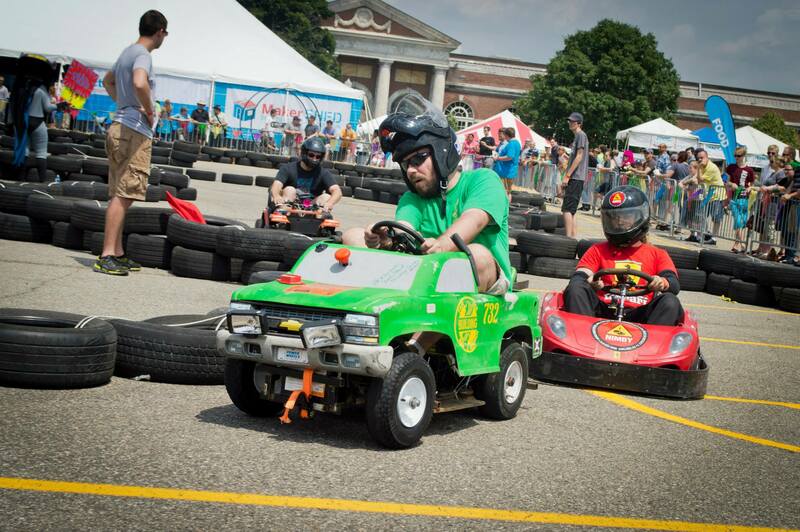 Team leader Matt Wirth is a seasoned silly race car veteran, having successful campaigned in both the 24 Hours of LeMons and Chumpcar, and it has shown with his race prep and having the sheer notion to not burst into flames every five minutes. After taking race wins in two weekends, the odds of winning the championship have swayed in their favor due to good ol’ reliability. 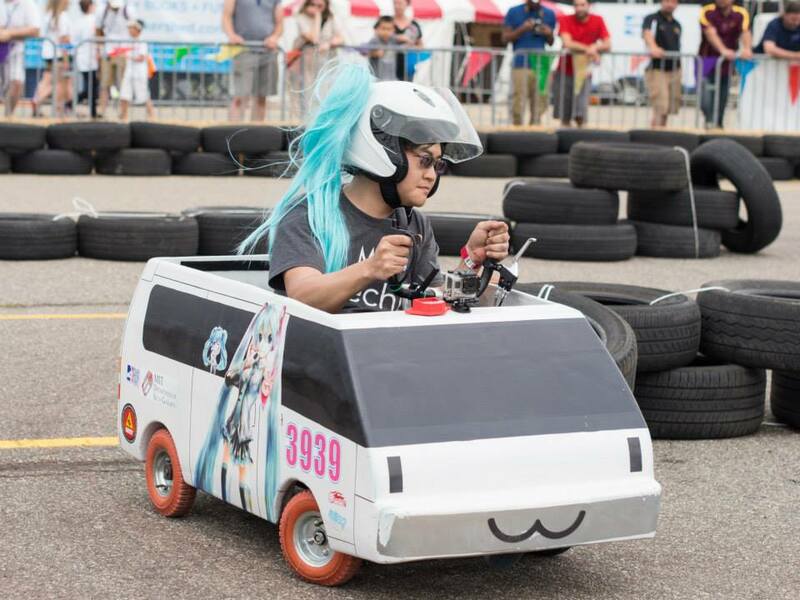 Even though Phantom Power Racing, Hack PGH and ChibiMikuvan have booked faster laps, those teams have not yet fully understood the pace you can have if your car doesn’t break every 20 minutes. Chopped and dropped. Then chopped again, and again. The Power Racing Series is all about misplaced professions in a sort-of professional racing series and Phantom certainly fits the bill. A dedicated group of Shure microphone engineers traded their guitar amps for amperes when they stumbled into the Series in 2013. Since then, their sparkling black-and-red mini hot rod has been very fast, thanks to their dual alternator motor setup and a custom I-swear-it’ll-be-open-source-when-we-get-better-documentation controller. Team leader Jon Halverson also opted to build his own LiFePO 4 pack from scratch to keep within budget for “better looking wheels.” While this has helped them with certain style points they haven’t been able to avoid a few bouts of bad luck and the tricky habit of literally running over the competition. Not afraid of a challenge, the team has added disc brakes so they now last longer than a block of cheddar, and upgraded their custom controller to the point that the car will be very fast or very broken. Miku spelled backwards is ukim. Which means nothing. You would think that MITers and Power Racing would go together like good ole boys and NASCAR, but this is only the first year that Charles Guan has managed to curtail his battle bot addiction and throw his legendary cat ears headband thing onto the PPPRS track. After two years of careful, calculated observation, Charles managed to dedicate some of his utterly impressively extensive R&D knowledge into a miniature version of his iconic 3rd generation Mitsubishi Delica van dedicated to 100% fictional 3D Japanese pop sensation Hatsune Miku. With a pole and a win his first time out, things were looking great. However, reliability has been a torturous hilarious endeavor as some of his last-minute wiring proved to be in his words “derpy.” The Chibi Mikuvan will head to New York with some refinement and a much-needed tire upgrade, but it’s still unclear if these changes will result in a championship win. 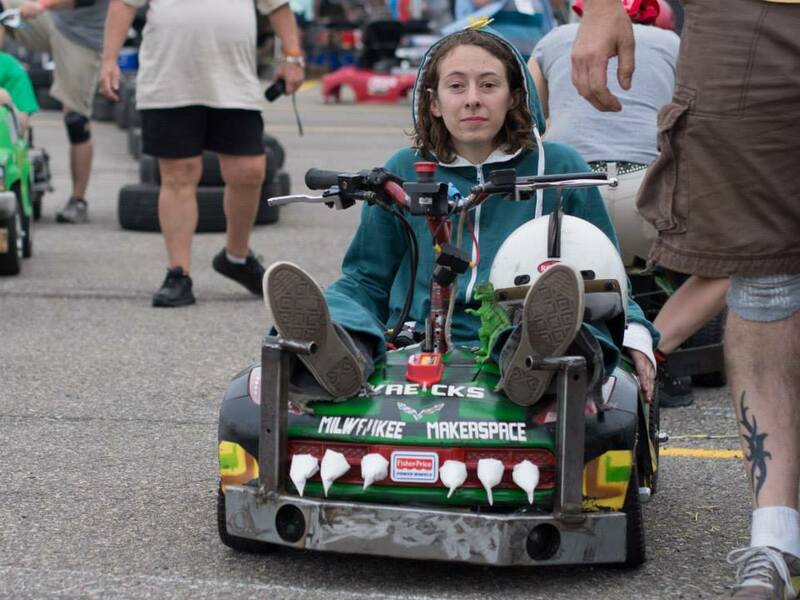 Regardless of the outcome of his race weekend, you must take some time to read the impressive Mikuvan documentation that includes custom controller algorithms, extensive water cooling, an intro to tire wear dynamics, and a comprehensive build page complete with magnetic chibi faces that can be swapped out mid race. This car also moonlights as a rolling Death Race 2000 reference. 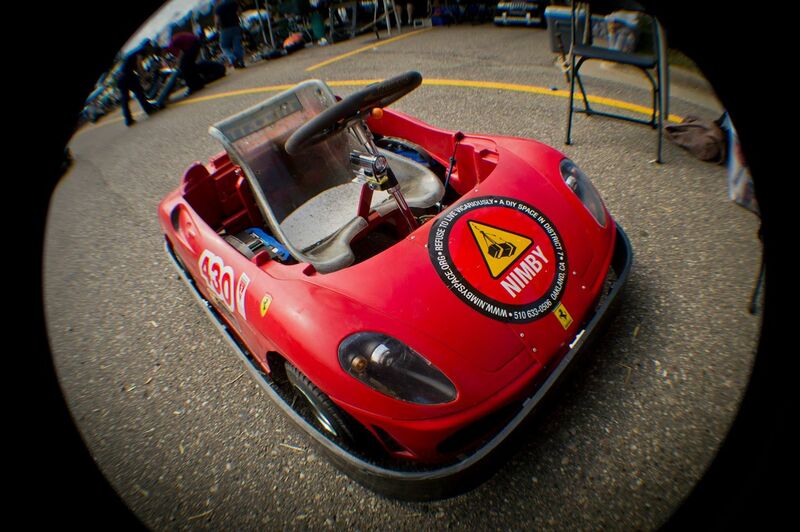 The outside contender for the title, not the fastest nor most aggressive team, but certainly determined to put those years of experience to work: Lotusaurus Wrecks is the culmination of many seasons of close-but-no-cigar racing from Milwaukee Makerspace. Driver and lead engineer Audrey Horst has elected a safe and cautious approach to her 2014 campaign, preferring to keep the car out of absolutely any trouble, which has rewarded her with a surprise win in Detroit. Her reasoning must be a proud counterpoint to the utterly insane decision to build the car from the ground up, including casting the hubs from scratch. This is a proud tradition of midwestern hackerspaces and the level of ambition to build anything they can from piles of scrap far outweighs the lap times such source materials produce. 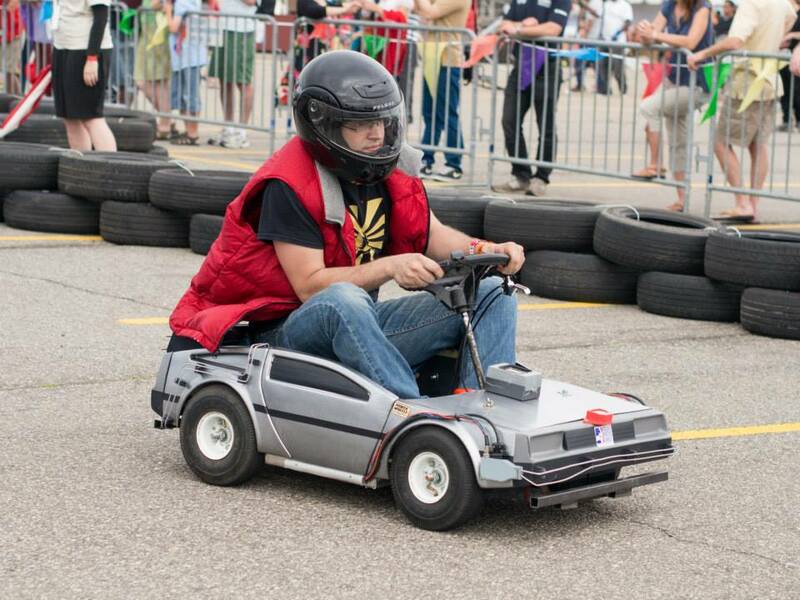 When this baby hits 8.8 miles per hour….. This season has seen some seriously insane stabs at Moxie cars. Long gone are the days of half-hearted, last-minute, glued on feathers and LEDs to appeal to a crowd. Now there is a custom vacuum-formed mini DeLorean to embarrass the pretenders. Designed in CAD, CNC’d out of foam, and squished to life in Hack Pittsburgh’s very own vacuum former, the Hack to the Future DeLorean is everything you ever wanted from the 1988 Sears Christmas catalog. The car is built on a heavily updated chassis from their 2012 and 2013 campaign and has become incrementally faster than Reagan-era Libyan nationalists. A few flats cost them first in Detroit, but they have made considerable performance and cosmetic updates since that fateful July. Expect team leaders Eli “Nobody Calls Me Chicken” Richter and Chad “A Bolt of Lightning” Elish to play in character the entire weekend. Video production artists love this team because you can edit them out of anywhere. You have to get credit for a car built around a wooden floor board. Aside from a few questionable design choices involving excessive roll over and a nigh-impossible-to-fit seat, this Jersey squad has managed to build a fairly competent and reliable machine. It’s not fast, but it will pass far louder and more fire prone entrants with a quiet persistence. Using some ancient motor from some absurdly old piece of industrial equipment, there’s a good chance that such a motor will never die. FUBAR is building an entirely new entrant for this Championship Race, and it just might be their best yet. Favorite Color: Black, or sometimes gray Legos. 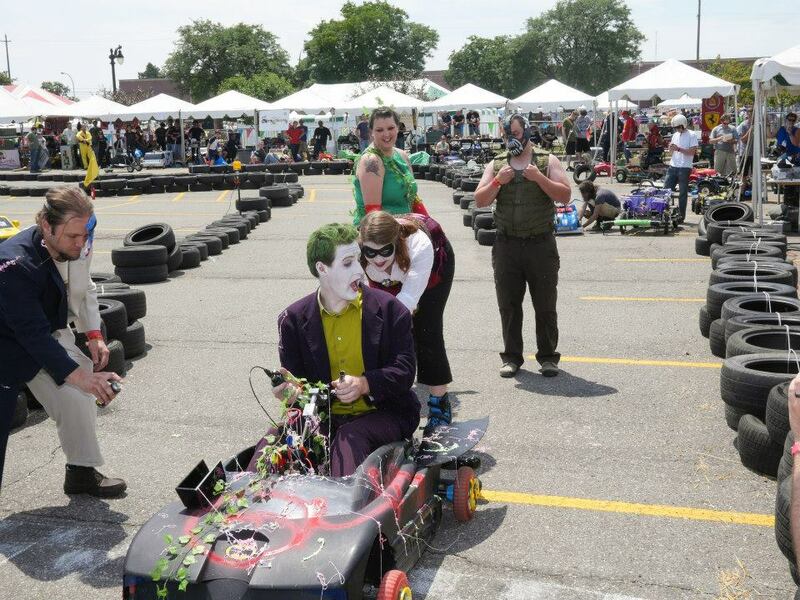 Secret Weapon: The Joker is an accomplished Rally Racer. The proverbial dark horse. The Batmobile certainly earns lots of love from the crowd, and the cosplay performances by this first-year team are almost as impressive as their build, which was completely rebuilt after Detroit to the point where I don’t even know what’s under the plastic anymore. They also managed to impress the teams by one-upping Milwaukee Makerspace with 3D printed hubs that didn’t break. Worry not sports fans, as plenty of other things broke, including the pile of pink Harbor Freight tires which were never ever intended to be used in a motorsport. Either way, expect this car to be quicker, and the costumes to be better than everyone else’s. So if you like what you see here, head on over to Zone 2 at 2pm, 4pm or 6pm on Saturday or at 1pm on Sunday for some pint-sized racing that will be just as confusing as it is exciting!